Francis and I were talking this evening. I told him, "I got up this morning at 5am!!" "Did you run?" he asked, totally incredulous. "You're like a different person..."
I've always struggled with morning running, being far too lazy and happy in my bed to get up early. Even if I've managed it for a couple of days, I've always failed to maintain it, and for the last few months, I've barely been able to drag myself out on night runs either, despite telling Francis throughout every evening that I was on my way. I might sort it out and run for a few days here an there, but then would lapse back into nothing. I felt guilty for not running but couldn't make myself want to go enough to actually do it and have just been lurching from race to race! I felt like I was losing touch with who I was despite desperately fighting to get back to normal. Anyway, I can understand Franc's surprise at my 5am start, and his surprise that I was running again. All of a sudden, and for the first time (I think) I have been able to maintain morning runs. I've been following my plan, and we're not just talking about hauling myself out and plodding around - I've concentrated, put in some effort as well as done some sensible easy runs...tomorrow morning I've got another tempo session. It feels different...brilliant...I feel like a real runner again, like myself. I've been rewarded with some beautiful countryside trails, with stunning morning sunshine lighting up the vibrant autumn leaves, with sloshing through rain and mud. My mood generally has drastically improved. 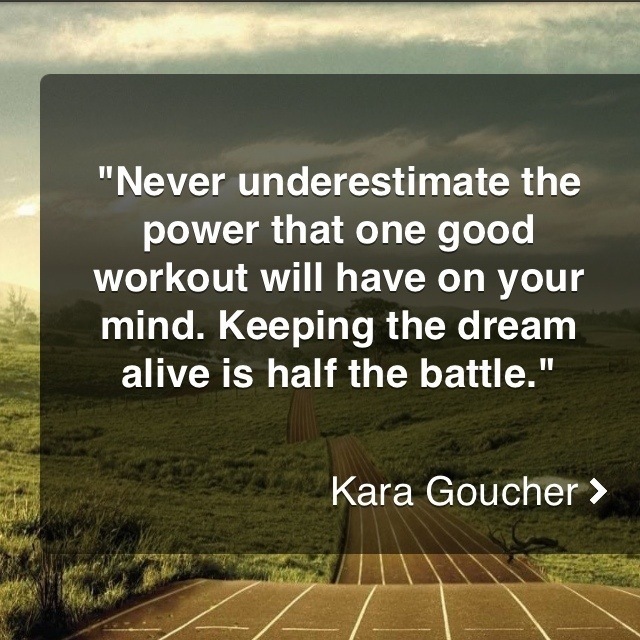 More running = a happier and less stressed me! Running Chelmsford marathon a couple of weeks ago was so much harder than it should have been. 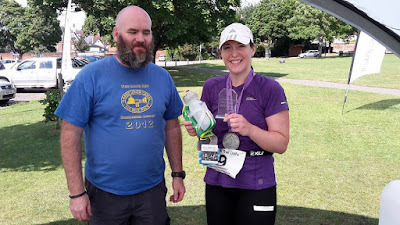 It was a bit of a wake up call - I realised just how much of an effect not running regularly was having on my race performance, and when I saw the photos of me I realised just how much weight i'd put on too. I was not impressed with myself, especially as I knew that even feeling so disappointed wouldn't make any difference and I still wouldn't be able to make myself do any training. I realised I needed some help and something had to change if I had any chance of doing justice to all the ridiculous races I've entered for next year. I've known Lindley for about three years, have shared some miles with him out on the trail, taken part in lots of his races and he and his other half Maxine looked after me at 120 miles into the Grand Union Canal Race! He's been coaching other runners for a while now, and I thought he might be the man to kick me back into shape and to help me start training again! I've tried coaching before, and it didn't really work for me, but Lindley talked to me in great depth about my running, what I wanted from coaching, how he could help, and how we could make it work. Everything he said made a lot of sense, and so I signed up with Coach Chambers! It really feels very different this time. The training plan that Lindley's written for me makes sense, is straightforward, and suits me, and he's agreed not to ask me to cancel my races, but will work with me to help me be the best runner I can while racing as frequently as I do with legs that never really recover! He's been keeping an eye on what I'm doing via my posts on Daily Mile, and has been in very regular contact which was such a motivator for the first few days, and I'm sure will continue to be. I know that if I don't post to say that I've run that morning, he'll be getting in touch to find out why! It's also fantastic to get home after work and not have to worry about having to go for my run because I did it that morning - it's such a relief to have already done it. So, it seems the wake-up call from Chelmsford, and of course Lindley's guiding influence, is changing me. 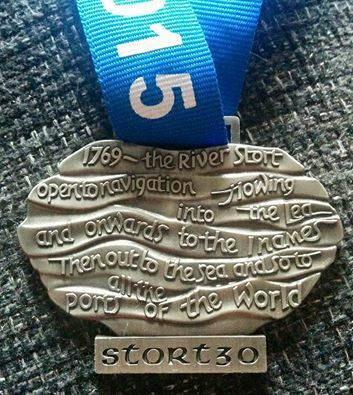 It's only been a really short time, but out of nowhere I've maintained my commitment to morning runs, rediscovered my enthusiasm and on Sunday had a hugely enjoyable race at the Stort 30 mile event, coincidentally put on by Challenge Running. It helped that I had friends there, that the weather was perfect and the course looked absolutely stunning, but the miles ticked by really quickly and I was disappointed when the race was over. Not sure there are many people who can say that at the end of 30 miles! I was a bit frustrated with my time (5:25) as it was my slowest out of three Stort's I've run - but I know that my pace will start to improve. I love my medal too. Now I just need to keep the momentum going...but this time I have help. 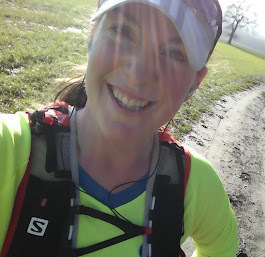 I've been trying for so long to become a better runner and every time I try something new to help my training, I seem to fail after the first blog post! But when I start to lose enthusiasm for the cold and rainy mornings, and I expect I will, I'm confident that this time, Lindley isn't going to let me give up. Maybe this is where my running will really start to get better. Love this - I have always had a problem with consistency, but due to your positivity I feel inclined to get a plan together and to get out there and do it!